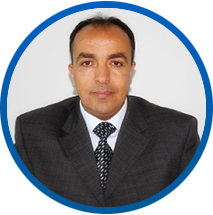 Since July 2001: Professor at Faculty of Sciences, Mohammed First University, Oujda, Morocco. 1993-2000: Assistant Professor at Faculty of Sciences, Mohammed First University, Oujda, Morocco. 1992-1993: ATER (Temporary Attached of Teaching and Research) at Nanterre University, France. 1991-1992: ATER (Temporary Attached of Teaching and Research) at Anger University, France.